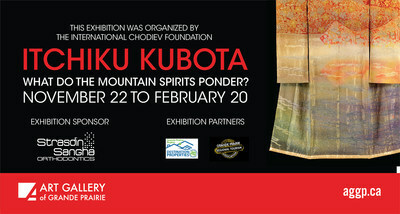 The International Chodiev Foundation (ICF), the charitable foundation established by Dr Patokh Chodiev, today announces that The Kubota Collection's new exhibition 'Itchiku Kubota: What Do the Mountain Spirits Ponder?' will be opening to the public on 22 November 2018 at the Art Gallery of Grande Prairie, within the Montrose Cultural Centre in Grande Prairie, Alberta, Canada. This will be the first time that Kubota's work has been shown in western Canada. This is also the last exhibition of the kimono in North America before they return to Japan. Kubota's unconventional designs, distinctive use of color, and intense commitment to his art and craft were drawn from his interest in and revival of tsujigahana, a 16th century Japanese textile art form that had been lost for centuries. Kubota's revival of this technique and the evolution of his own unique style of Itchiku Tsujigahana were highly influential and Kubota's work has received great and growing acclaim both nationally and internationally. The International Chodiev Foundation is a charitable organization, established in 1996 by international businessman and philanthropist Dr Patokh Chodiev. The Foundation's work comprises a broad range of programmes focused on international relations, education, publishing, philanthropy and the arts and is based on the following three central pillars: fostering Russia-Japan relations; supporting The Moscow State Institute of International Relations (MGIMO); and aiding children. The Kubota Collection is managed by the International Chodiev Foundation ("ICF"), the charitable foundation established by Dr Patokh Chodiev.Â Since 2013, the ICF has funded exhibitions of the kimono in 14 countries including Russia, Kazakhstan, The Netherlands, France, Belgium, USA and Canada. Due to the ICF's support, the unique collection of kimono has been viewed by more than a million connoisseurs of Japanese art around the world.